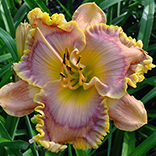 ANGELS OF HEAVEN (D. Trimmer) Tetreploid (Sunday Sandals x Blue Hippo) 30” M. Re. Ev. 6” This round full pale ivory bloom has a pale gray blue eye etched in violet. The double edge is violet and purple surrounded by gold. 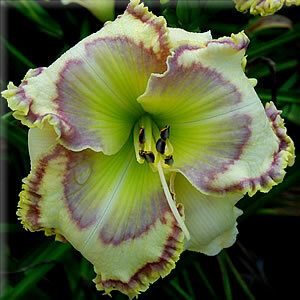 This extremely vigorous, strongly reblooming cultivar has 3 branches and about 16 blooms per scape. ANGELS OF HEAVEN was named for an event that happened to me during my hospital stay. Following a second emergency heart surgery I was in intensive care with a serious heart rhythm problem and a rising fever. Unable to sleep, but with my eyes closed I marked the passage of the night by the hourly tightening of a blood pressure cuff. During one such hourly passage I became aware that my room was now about half lit when “somebody” put their hand onto my right shoulder. Thinking I had missed Jane or a nurse coming into my room I quickly opened my eyes only to find the room dark, and I was alone. Moments later the room again became half lit and again “somebody” put their hand on my right shoulder. I waited several seconds and then quickly opened my eyes only again to find the room dark with no one there. I didn’t feel quite right, so I rang for my nurses. When they attended me they were very surprised to find that within that hour my heart had gone back into rhythm, and that my fever had returned to normal. There are angels in heaven! I am now the picture of health.